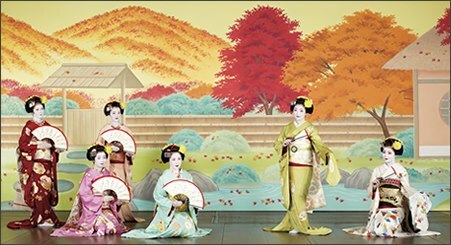 Gion Odori,well known as Maple dance,is an annual event performed by the geiko and maiko of Gion Higashi. From the first time in 1894,Gion Odori has been much anticipated as a special entertainment in Kyoto by both the local and visitors. The 55th Gion Odori is about Ozashiki asobi,traditional games as a part of entertainments being held after dinner time in tea house. Scenes unfold back and forth between a real drawing room and imaginary world of games,where characters of games lively dance lively.